Spray 5-quart slow cooker with cooking spray. Heat 12-inch skillet over medium heat; cook bacon 10 to 15 minutes or until crispy. Transfer to paper towels to drain. Crumble 3 slices of the bacon; cover and refrigerate until ready to serve. Crumble remaining 3 slices, and transfer to slow cooker. Pour all but 1 tablespoon bacon drippings out of skillet. Add onion to skillet; cook 4 to 6 minutes, stirring occasionally, until tender. Transfer onion mixture to slow cooker. Stir in broth, potatoes and ranch dressing mix. Increase heat setting to High; stir in whipping cream. In small bowl, beat cornstarch and water with whisk. Beat cornstarch mixture into soup; cover and cook about 15 minutes or until slightly thickened. Add Kraft™ Velveeta™ cheese to slow cooker; stir until melted. Add 1 1/2 cups of the Cheddar cheese; stir until melted. 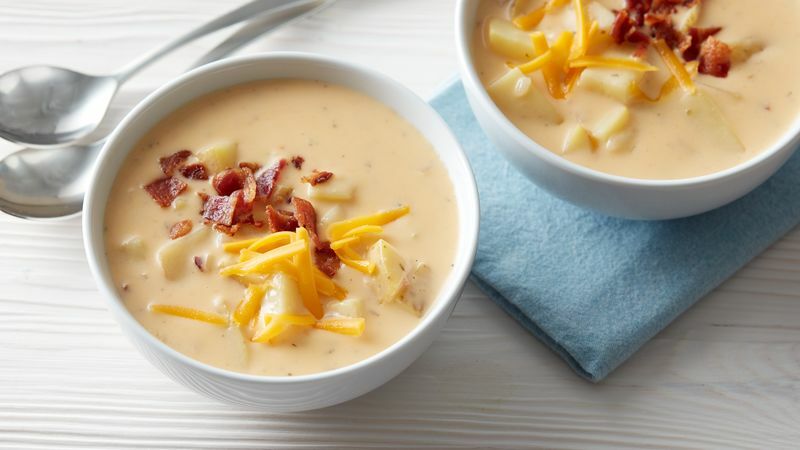 Serve soup with remaining 1/2 cup Cheddar cheese and reserved crumbled bacon.